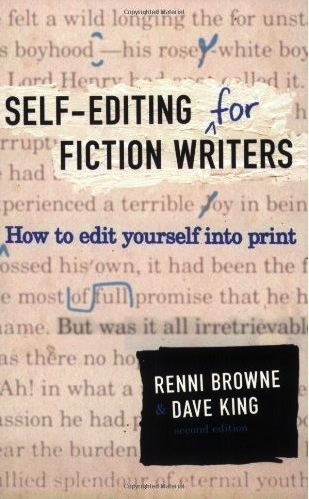 The subtitle “How to Edit Yourself into Print” provides a warning: today’s book publishing agents look for copy that has been skillfully pre-edited before it gets to them. The old days when house editors lended a hand are gone. More than ever, they say, one is wise to learn to DIY. Or maybe it’s SEY (Self-Edit Yourself). Handsomely produced and over-abundant in verbiage, the content provides maxims and guidelines. It’s familiar ground. Nothing about it strikes me as the Go-to book on the SEY process. Instead, most of the topics point back to the initial creative writing process. This more or less says to me, you need to make all these edits because you didn’t write well in the first place, and…so now, let us now discuss how to write. The thrust of this book lacks clear distinction between fixing a draft (which I had hoped it would, like a field manual I can refer to when I redline) and writing a draft. Come on, guys. Even if we didn’t know what the main POVs are, or how to write dialog, are these really self-editing topics? What if all the bugaboos the authors talk about were absent and things were written well in our drafts? What other editing advice do the authors provide? There’s got to be more to editing than fixing show vs. tell passages (pretty shopworn advice, that one is, and you beat it to death. We’re not all screenplay writers out here). And I think most of us know how to break up dialog and we can usually spot a dangling participle. Seems we could get some more pointed writing tricks of the trade. Enlightening us more about technique rather than mechanics.Maybe even something more subjective, like how do we prepare our mindset to view things fresh so we can fix them? How do we make a chapter become impressive reading rather than simply something correct by your rules? In this respect, the teacher-narrators of this book are no match for the guys who both teach and impart wisdom, like Jerome Stern or Sol Stein. It does have some useful information. The chapter on adding “Sophistication” offers valuable ways to check your prose for amateur mistakes. This section is presented cleanly without as many rambling paragraphs as we suffer in the rest of the chapters, where “do’s and don’ts” are not so easily gleaned. But what’s perfect? Nothing. So maybe their general layout needed the edits of another set of eyes. Self-editing can be blind, after all. Overall, it misses the mark. It lacks thrust. It tries to regulate the very nature of free exposition. It begs for an intimate connection. It does not meet the writer as a friend but as a subscriber. It has sort of a chiding schoolmarm tone, like “Why would you want [to do that]?” Oh, we’re just dumb students, that’s why. To make us feel even more like geniuses they include writing exercises – with answers! They’re not exercises, as in normal writing books, they’re little exam questions with no set answers. Well, okay. Maybe this was a workshop course they turned into a book. I suspect its content and delivery has roots in the pedantesque Writers Digest Factory of Experts. “we see that sort of thing all the time and it’s wrong” (the Royal Condescending We). Posted in booknotes, Writers' Corner on October 23, 2012 by Wm P.